Be free to turn down or turn up air volume. The grill is small so baby cannot fit fingers through and get hurt. It is a great green energy, environmental friendly fan. The fan has a wheel style control on the back panel you can adjust the speed low to high as your will. Removable battery structures make you more convenient to maintain or replace batteries. There are foam pads on the top and bottom of the clip which is nice and sturdy. The clip is a nice size and can attach to many different surfaces, it opens about two inches wide. 5 inch small rechargeable baby stroller fan and different speed choices- low and high speed according to your demands by speed slider. While powered by the USB, There is only one speed. Clip on fan and desk fan in one, easily be attached to a variety of different things having a ledge, like baby stroller, car seat, treadmill, a table, desk or chair. This fan comes equipped with an easy-to-open clamp with rubber grips that can be placed virtually anywhere without scratching the surface. 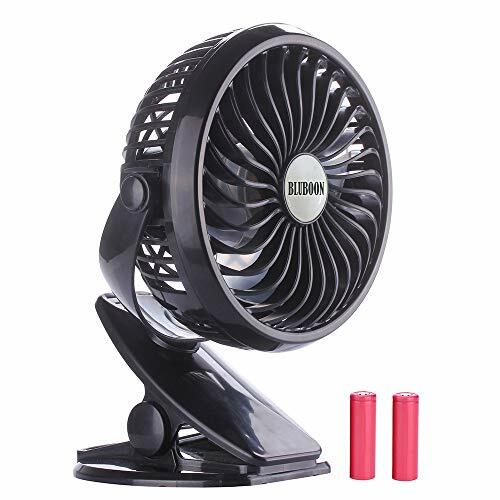 This battery powered fan can literally rotate to cover anywhere you want to aim it 360 degrees producing a strong airflow with low noise. The fan is working by 18650 battery, or can be also powered by 5V USB power source. Portable mini desk fan clip can be perfect for cooling in the summer, lightweight and suitable for bedroom, home, office, kitchen, gym, golf, game, dorm, train, bike, trip, camping, walking, studying in the school, working or sleeping, or at the beach. Rechargeable fan with One 2200mAh 18650 Battery can run about 2.5-6.5 hours at the full charge and just charge it with the USB cable and any 5V USB Charger whether it's a DC 5V wall charger, computer USB port, USB hub or power bank, car charger, phone charger etc, so you can use it anywhere you need. If you have any questions about this product by BLUBOON, contact us by completing and submitting the form below. If you are looking for a specif part number, please include it with your message.